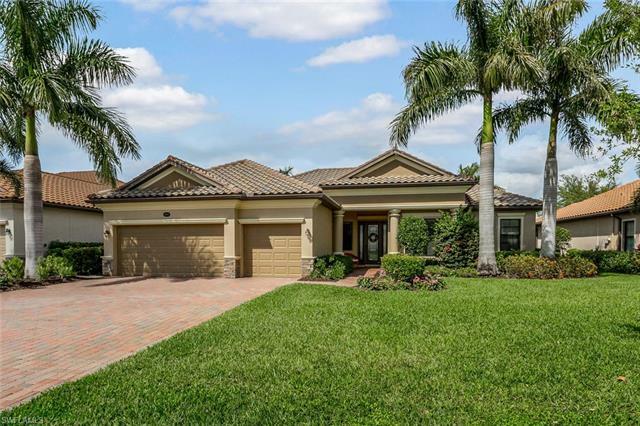 Heritage Bay real estate includes homes and condos for sale in this golfing community located in Naples Florida. Heritage Bay is a bundled golf couse gated community in Naples. Membership is included in the 27-hole golf course with the purchase of your home. Other amenities include lighted soft-surface tennis courts with grand stand center court. Men's and women's locker rooms, resort-style pool with tiki-bar, sauna, and spa. The country club offers casual and fine dining restaurants, card room, and state-of-the-art fitness center. Heritage Bay real estate includes Heritage Bay condos and single-family homes. Many of the lots have lake or golf couse views. Single-family floor plans include the Ascot, 1,997 air-conditioned sq. ft., the Foxhall with 2,280 sq. ft., and the Brighton, 1,849 sq. ft.
Heritage Bay borders with The Quarry another golf course community sharing some of the same lake front. If you are a golfer there are a number of golf course to choise from. Lennar is the builder of Heritage Bay and if you would like to view new or re-sale property in any community call 888-999-3208 and talk to one of our skilled agents.